Shed Happens: All That Dog Hair Can Be Something Beautiful! - Knit Your Dog! Home Shed Happens: All That Dog Hair Can Be Something Beautiful! Shed Happens: All That Dog Hair Can Be Something Beautiful! 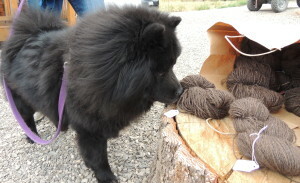 The wool tumbling out of this bag is 100% pure Chow Chow, simply brushed and collected. Baa Baa Black Chow, have you any wool??? We can do it, you can do it, or we can do it together! Learn about how to collect your dog’s hair, what kind of wool it makes, what we can make with it, and get answers to all your questions on this site. You can contact us, too: just click on that green tab on the side of the page!